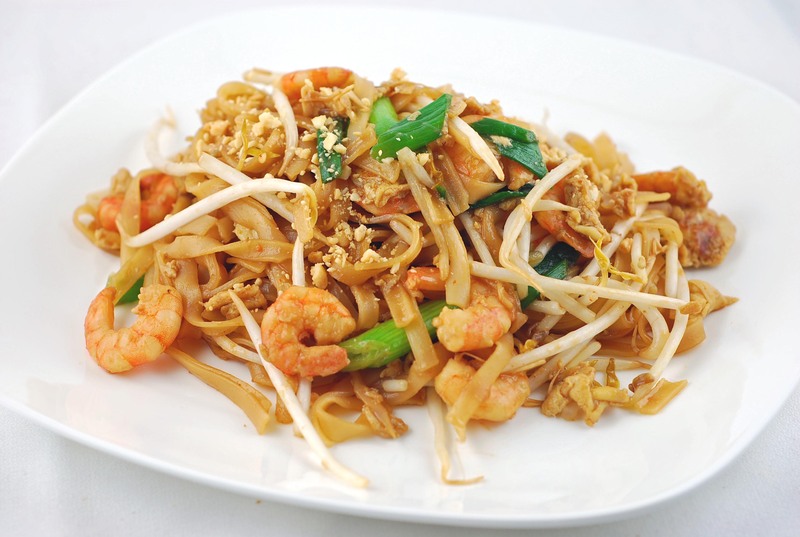 Easy to make at home-easier than you thought, I’m sure-and better than most pad Thai you’ve had in restaurants. Just make sure you have everything on hand and prepared before you start stir-frying, because it goes pretty fast once the heat is on. 1. Put the noodles in a bowl and pour boiling water over them to cover. Soak until softened, at least 15 minutes; if you want to hold them a little longer, drain them, fill the bowl with cold water, and return the noodles to the bowl. 2. Put 2 tablespoons of the oil in large skillet over medium heat. When hot, add the eggs and scramble quickly for the first minute or so with a fork almost flat against the bottom of the pan; you’re aiming for a thin egg crêpe of sorts, one with the smallest curd you can achieve. Cook just until set and transfer the crêpe to a cutting board. Cut into 1/4-inch strips and set aside. 3. Raise the heat to high and add the remaining oil. When hot, add the garlic and shrimp and cook, stirring occasionally, until the shrimp lose their raw gray color, about 2 minutes. Remove from the pan with a slotted spoon and transfer to a plate next to the stove. Add the tofu, scallions, and half of the bean sprouts to the pan and cook, stirring occasionally, for 3 minutes. Transfer with a slotted spoon to the plate with the shrimp. 4. Put the drained noodles, eggs, nam pla, tamarind, and sugar in the pan and cook, stirring occasionally, until the noodles are heated through, then add the stir-fried tofu mixture. Toss once or twice and transfer the contents of the pan to a serving platter. Top with the peanuts, cilantro, chiles, and remaining bean sprouts. Serve with the lime wedges. Omit the shrimp and increase the tofu to 8 ounces. Substitute soy sauce for the fish sauce.